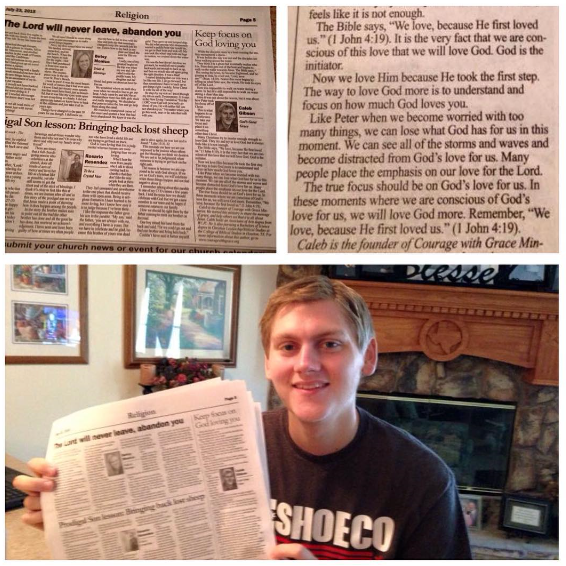 Caleb with his first ever newspaper article. Opportunity, Webster’s dictionary describes this word as, “A good chance for advancement or progress[i].” This is what has happened lately in my life. I have been given an opportunity to write a weekly column for the religion page of my local newspaper. The name of the column is called, “God’s Great Grace.” The grace of God is not just good, it is great! I wrote about how we love because God first loved us (1 John 4:19). Many times God will place us in situation where we have a voice. We have to use that opportunity to speak and share the love we have received. The newspaper is called the Sentinel and is located in Bay City, TX. It comes out every Thursday, so if you live in town be sure to pick one up. You can also read the digital version online, and you can subscribe if you click here. My goal is to help spread the love of Christ. I really believe that this is, “A good chance for advancement,” of the gospel of grace[ii]! [i] Merriam-Webster Dictionary, s.v. “Opportunity,” accessed July 25, 2015, http://www.merriam-webster.com/dictionary/opportunity. Background photo by Jon S.